One of my favorite spots of 2016 is Momosan Ramen & Sake on East 39th Street in Murray Hill. The restaurant has a sleek design but not pretentious. Servers are friendly and helpful. The food is tantalizing and surprisingly affordable. It is the work of Iron Chef Masaharu Morimoto and well worth a visit. Start with some sake. 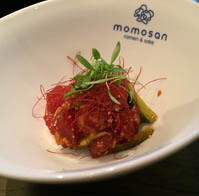 Momosan offers an extensive list from across Japan. It's served in every degree from room temperature to warm to piping hot. Prices range from as little as $19 for a carafe to $56 for 2 ounces. The sake is served in a shot glass that overflow into a small tray, symbolizing "happiness forever." After a few sips we were feeling quite happy. The dishes we loved the most were among the smallest. Kakuni Bao ($4 pc. ); steamed bao filled with braised pork belly slathered with a mustard may are divine. What's not to like? The Peking Duck is also excellent. It's served in a crisp gyozo skin like a mini taco with cucumber, hoisin and an apricot chili sauce. Our group was also a big fan of the Chashu Salad. Pork cooked in a spicy garlic sauce is wrapped in ribbons of cucumber slices. It's cool, hot and utterly delicious. 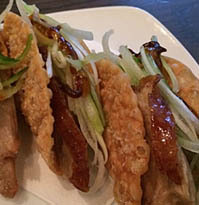 Another dish worth seeking out is the Crispy Mimiga. It' actually deep-fried pig's ear with shichimi and Japanese mayo. The crispiness makes this dish utterly addictive. Just don't tell anyone it's pig's ear. Zuke Maguro is a stunning plate made with soy marinated tuna, tataki, cucumber and taberu rayu, and the closest thing you will find to poke on the menu. Which brings us to the ramen. We tried two types; Spicy Tan-Tan Ramen and the Duck Ramen. The Tan-Tan is made with pork chashu and red miso ground pork served in a spicy coconut curry topped with cilantro and soft-boiled egg. It was good but a tad too salty. 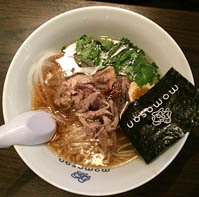 The Duck Ramen, on the other hand, was fabulous with lots of duck, ramen and a soy-marinated egg in a hearty broth. Diners can also add their own toppings, including braised pork belly, soy-braised bamboo shoots and toasted nori. All-in-all, Chef Morimoto appears to have a winner on his hands!